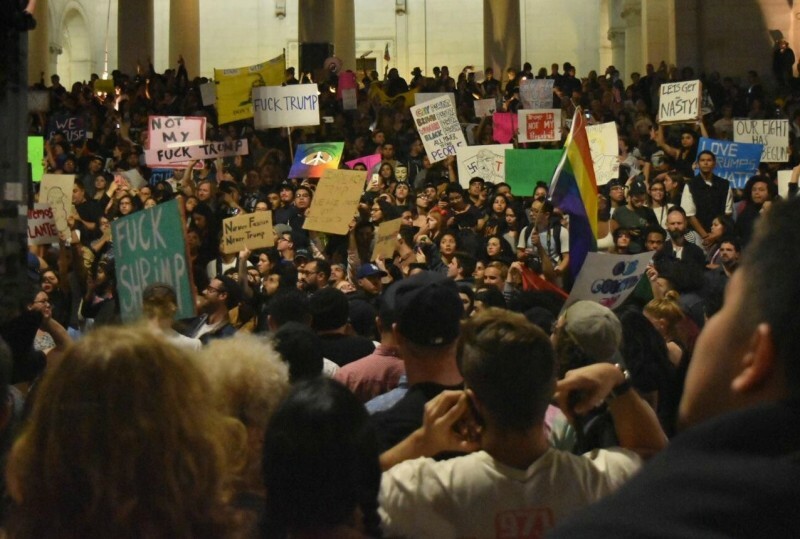 Thousands in LA take the streets to protest Trump | Fight Back! Thousands of protesters took to the streets here, at 8 p.m., Nov. 9, chanting, "Say it loud, say it clear! Immigrants are welcome here!" and "Women's rights are human rights," and “He’s not our president!” Protesters climbed buildings at the Civic Center and waved Mexican flags. Protesters marched onto the Hollywood freeway and shut it down for hours. 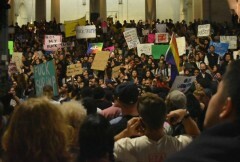 30 demonstrators were arrested by LAPD. On Nov. 10 students from West LA to East LA walked out of schools to protest Trump. In ELA the San Bernardino freeway was blocked near Cal State University Los Angeles until the California Highway Patrol and LAPD cleared it. Over the next few days, protests are planned against newly-elected President Donald Trump.